The United States is expressing deep concern about the direction of the peace process in South Sudan, saying President Salva Kiir and opposition leader Riek Machar "have not demonstrated the leadership required to bring genuine peace and accountable governance" to the nation. "We remain skeptical that they can oversee a peaceful and timely transition to democracy and good governance," a statement by White House Press Secretary Sarah Sanders said about Kiir and Machar. 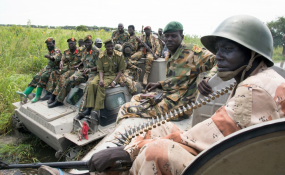 South Sudan gained independence from neighboring Sudan in 2011, but in late 2013 erupted into violence over a power struggle between President Kiir and his former deputy, Machar. Several cease-fires have been violated. The warring parities, meeting in Khartoum last week, failed to agree to a power sharing deal. "The South Sudanese people deserve an end to the violence and a future marked by prosperity and freedom from fear. We remain committed to supporting the South Sudanese people and to saving lives, and we continue to share their aspirations for a peaceful and prosperous tomorrow," White House Press Secretary Sanders said.